Click to download and install the latest version of ffmpegX for MacOSX 10.2, 10.3 et 10.4. The options tab includes encoding options related to the selected video codec. It dynamically changes depending on the selected encoding engine, in order to show only the available options for a given codec. Enables high quality mode. Encodes each macroblock in all modes and then choose the best. Slower, but results in better quality and file size. Include one B-frame in the sequence like in DivX5 (IBPBPBPBP..). B-frames require less data than P-frames. Use four motion vectors per macroblock. Slower, it gives better compression and higher PSNR. Encode in 2-pass mode. The file will be encoded two times, the first one will calculate bitrate statistics in a .log file, and the second one will use those statistics to optimize the final encoding. blue=this bitrate is too high, if you choose it you will not improve quality comparing to "green" values and you'll be wasting space on your disks (consider choosing another bitrate, or use a larger image size, though not larger than the source image size). Activates Trellis quantization. Finds the optimal quantization for each macroblock in the PSNR vs bitrate sense. Slower, higher quality. Activates quarter pixel motion estimation. Affects the resolution of macroblocks search, leading to a more precise movement detection. Slower, higher quality. Not compatible with some players. Selects the algorithm used to resize the image. Choose the default "fast-bilinear" when speed is important. For better image quality but slower encoding, you can choose either Bicubic (best for upscaling, ie scaling to a larger size), Bilinear (best for downscaling, ie scaling to a smaller size than source), Lanczos, or Bicubic spline (sharp picture). Sets the comparison function used for motion estimation (affects quality). SAD=Sum of Absolute Differences (fastest, default), SSE =Sum of Squared Errors (better quality, fast), SATD=Sum of Absolute Hadamard Transformed Differences (a bit better than SSE, slow), RD=Rate Distortion optimal (best quality, very slow). Select the interval between I-frames or keyframes. I-frames need more data to encode the picture. Seeking is only possible to a keyframe. Don't use values higher than 300 for MPEG-4 and XviD, as quality can be affected. MPEG-1 and MPEG-2 should always use 12. Sets the minimum quantizer. The quantizer is the compression level used to encode a frame. More compression means smaller filesize and less image quality. Complex frames will require more compression in order to fit in a constant bitrate, so the quantizer will vary within the qmin/qmax range in attempt to control the bitrate. Range is 1-31, though qmin=1 is not recommended. Setting qmin=qmax will lead to variable bitrate encoding. Sets the maximum quantizer. Range is 1-31, recommended range is 10-31. Encode only a 5-seconds clip. Useful to test encoding options. Also prints a more detailed output in terminal. Prints the peak signal to noise ratio for the whole video after encoding, and stores the per-frame PSNR in "psnr_hhmmss.log". Returned values are in decibel, the higher the better. This gives a good indication of the encoding quality which is being achieved. Use in combination with "5 seconds test clip" to quickly evaluate which encoding options will give the best quality and which fps you'll obtain with, so as to decide the better quality/speed tradeoff. mencoder XviD has the following options. They are mostly similar to mencoder libavcodec mpeg-4 options. Sets internal thresholds in order to take better decisions on motion vectors and improve quality on flat-looking cartoon or anime. Enables support for interlaced encoding. mencoder H.264 MP4 has the following options. Enables H.264 Context-Adaptive Binary Arithmetic Coding to improve entropy coding and achieve smaller files (slower). If enabled (default), encodes at the specified constant bitrate by varying the quantizer between qmin and qmax. 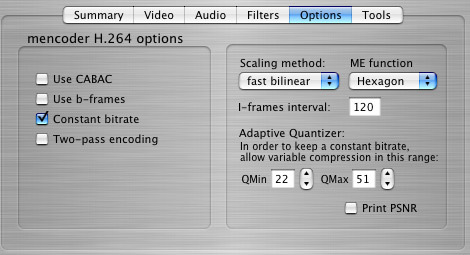 Please note that for H.264 the quantizer value has not the same meaning as in mpeg-1, mpeg-2 or mpeg-4. The quantizer range is from 2 to 51 on a logarithmic scale (so eg. the bitrate difference between q=20 and q=40 is only a factor of about 10). If "Constant bitrate" is disabled (default), then the qmin value is used to encode at constant quality, variable bitrate. A good range for qmin is 20..40 (default=22). Sets the comparison function used for fullpixel motion estimation (affects quality). Available values: Diamond search (fastest), Hexagon search (default), Uneven multi-hexagon, Exhaustive search (very slow). x264 H.264 MP4 has the following options. Enables b-frames (not compatible with iPod). Enables analysis of i4x4 partitions. Enables Trellis quantization (requires CABAC enabled). Use Quicktime to decode. 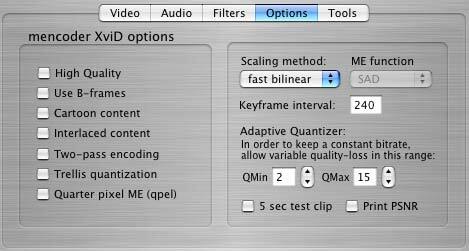 May be useful to convert from Quicktime movies using formats not otherwise recognized (slower). Set h.264 encoding level. 1.3 low bitrate encoding level should be used for iPod. You may use 5.1 otherwise (5.1 is also used in mencoder h.264). If using CABAC or b-frames, main profile is used. If not using CABAC nor b-frames, baseline profile is used. Set the comparison function for motion estimation (see mencoder h264). ffmpeg libavcodec mpeg-4, xvid, 3gp, DV, MP4, mpeg-1, mpeg-2 have the following options. Prints the per-frame PSNR while encoding. Returned values are in decibel, the higher the better. This gives a good indication of the encoding quality which is being achieved. Use it to quickly evaluate which encoding options will give the best quality and which fps you'll obtain with, so as to decide the better quality/speed tradeoff. Use only I-frames ie disable temporal compression. Faster, but resulting streams will lose much compression (size comparable to MJPEG). 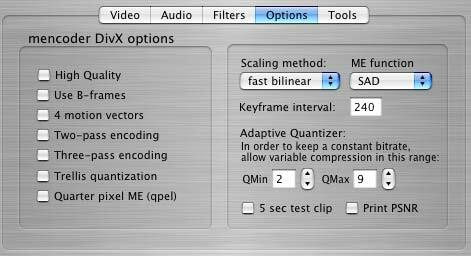 Use Quicktime to decode the source video (for mpeg-1 and mpeg-2 encoding, ie fast VCD, fast SVCD, fast DVD). Automatically adds blacks bars when necessary. 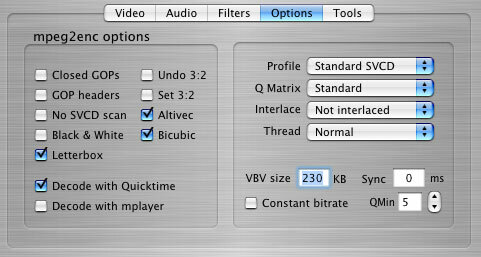 If your source is a VOB or MPEG-2 movie you will need the Quicktime MPEG-2 player component installed. If your source is a DivX movie, you will need the 3ivx.com and DivX.com codecs installed. Use this option to enable or disable letterboxing when "Decode with Quicktime" is used. 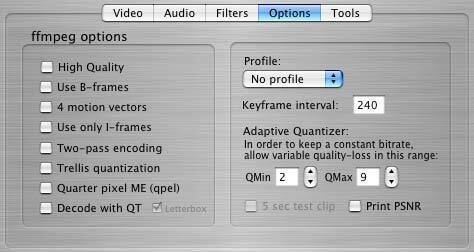 When "Decode with Quicktime" is not used, use the filters tab to manually set padding/letterboxing values. Choose mpeg-1/mpeg-2 profile. Available options are VCD, SVCD, DVD and PSP. Disable it if you want to overrid standardized settings. mpeg2enc mpeg-1 and mpeg-2 has the following options. Create only closed Group Of Pictures that can be decoded without reference to their predecessor. This is useful for streams that are supposed to be used in multi-angle DVD's and in some authoring applications like DVD Studio Pro®. Generate a "sequence header" at the start of each Group Of Pictures. This is needed by some player hardware to support fast forward/rewind/random access functions. Disable insertion of SVCD special scan offsets (intended to support"Fast forward/Rewind" functions), either in the case they cause problems, or you're not encoding a SVCD. Force black & white mode. Use it to reduce noise on black & white sources. Use the (Mitchell-Netravalli) high-quality bicubic upscaling and/or downscaling algorithm to resize the image (slower). Always used if not encoding to standard VCD or SVCD size. Convert widescreen anamorphic 16:9 to 4:3 letterboxed video, adding necessary black bars. 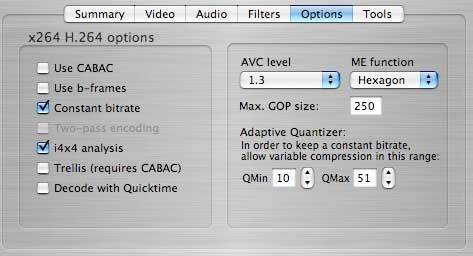 Use Quicktime to decode the source video. If your source is NTSC video and you experiment audio sync problems, prefer this option. If your source is a VOB or MPEG-2 movie you will need the Quicktime MPEG-2 player component installed. If your source is a DivX movie, you will need the 3ivx.com and DivX.com codecs. Use mplayer to decode the source video. Needed if you want to burn subtitles in the encoded movie. Currently only available for mpeg2enc mpeg-1 and mpeg-2 encoding. Please note that if you disable both "Decode with Quicktime" and "Decode with mplayer", ffmpeg will be used by default to decode. Choose mpeg-2 profile. Available options are standard SVCD (compliant to SVCD standard, bitrate set to 2500), XSVCD (as previous but with free bitrate and buffer size), Generic MPEG-2 (free profile), standard VCD (compliant to VCD 2.0 standard, bitrate set to 1150), XVCD (as previous but with free bitrate and frame size), Generic MPEG-1 (free profile), and DVD. Set a custom Quantization Matrix (need mpeg2enc binaries not older than Aug 28, 2003) in order to enable perceptual-optimized compression modes. Available values are "Standard", "High frequencies" (replaces the old "Encode hi freq" option, to encode as much high frequency information as possible from high quality sources), "kvcd" (will use kvcd.net "Notch" Quantization Matrix, allowing for 16% average bitrate reduction in VBR mode), "tmpgenc" (will use tmpgenc standard quantization matrix, allowing for 10% average bitrate reduction in VBR mode). Choose interlace mode. Available options are Not interlaced, Frame, Field. Define multithreading mode. Available options are Background (disables multithreading), Normal (one CPU), Dual CPU. Sets video buffer size for playback on hardware decoders. This should be 92 for VCD and 230 for SVCD. Adjust audio/video sync mux offset in milliseconds (positive values delays video, negative values delays audio). Sets the minimum quantizer for variable bitrate encoding. Lower quantizers will need high datarate, so if you want to increase quality, you will need to both lower the Qmin and increase the bitrate. For VCD resolution anything below 8 or so produces pretty good quality. For SVCD the equivalent level is around 10. Encodes in constant bitrate mode (required for VCD hardware playback).